Las Bóvedas, central of Cartagena. Fantastico!! I had a great time on my tour. Very informative. Come on an empty stomach. Lots of food to eat. Take your camera and be prepared to take tons of pictures. good experience, I really enjoyed the tour, the bus, the people and the explanation about the places that we visited were great! Clean, air conditioned beautiful coach bus. Arrived on time for pick up in front of our hotel. They went out of their way to make sure we had an English speaking guide, Andreas, who was AWESOME! Couple of things that could be better: 1 Change the name of the tour since the Convento de la Popa is not able to be part of the tour. We didn't get that notification until AFTER it was booked. 2 Stopping at the base of the fort to let people shop at the market seemed like a waste of time. I didn't see anyone get back on the bus with anything but food. 3 Would have liked more time walking in the old city. So many things we wouldn't have known without Andy! this tour combined the new city , the fortress, and the old city.Terrific . Would have liked a longer Old town tour. We had a great tour guide who spoke both English and Spanish and was very knowledgeable. We had a wonderful time. We were the only English speaking people, but our guide made sure we could understand everything. Super. Highly recommend. Order of visits changed, so what was advertised as the last stop ended up preceding the Walled City, which I then had to miss. I feel I wasted my money seeing Las Bovedas before the Walled City, and was very disappointed. Our guide Indyra was fantastic, highly recommend. 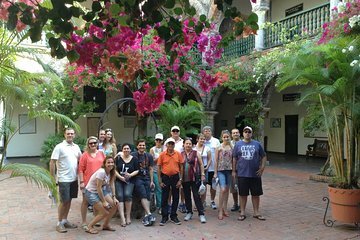 This tour was one of the highlights of our recent trip to Cartagena. We had missed out on the opportunity to book through our resort so I went online and booked with Viator. I was sent an electronic ticket for myself and my 2 fellow travellers. We were contacted by email and told where and when to meet, as well as the name of the tour operator. This is important because other tour drivers tried to pick us up, so I had to know that I was getting in the right bus. When our bus from Guianza Express arrived at the pick up location, they addressed me by name. Our guide Ismael was very knowledgeable and spoke good English as well as Spanish. The problem was that English speaking tourists were speaking while he spoke Spanish and missed when he switched back to English at times. Convents de la Popa, positioned on the highest point of Cartagena boasts some of the most impressive views of the Harbour and city. The architectural design is beautiful. The Castille San Felipe was next on our tour. Admission fees to both historic sites were covered by our ticket. We walked up the rampart to the top of the fortress where the setting sun cast a beautiful view of the city. The fort was very interesting and should not be missed. From there the tour went on to shopping in the Plaza de Bovedas. We had already been there and had to catch the shuttle back to our hotel so we left the group here. I thoroughly enjoyed this afternoon. Excellent. Knowledgeable tour guide who spoke English and they arranged a pick up from Hotel. only slight improvements would be it was a large group and not sure caught everything but otherwise little to fault. Popa in particular is a reasonable distance which doesnt seem practical to walk so more suitable for a tour. ou do get a great view from there. Nice trip. Guide was good but sometimes too friendly.